Cleansing and dietary “detox” programs have soared in popularity over the past decade. Chances are, you or at least one person you know has tried to eliminate bodily “toxins” through a diet program, herbal blend, or special supplement. While many people swear by cleansing, the practice has come under great scrutiny from the scientific community who says that cleanses are not only ineffective, but potentially dangerous. Is Cleansing Worth the Risk? In other words, a healthy diet over the course of a long period of time can yield better results than an intense program over the course of several days. Our bodies can be very adaptable, but we have to give ourselves enough time to see results. Just like you couldn’t get in shape for a marathon through a week of extreme training, you are also unlikely to reverse years of unhealthy living over the course of a week. Taking things slowly can also protect us from the dangers of cleansing and crash dieting. Flooding our system with heavy amounts of foreign herbs, chelating agents, and other cleansing supplements can lead to a number of unwanted side effects. And severe caloric restriction can interrupt our body’s normal metabolism. Conversely, simply swapping out the bad foods in your life for healthy ones can allow your body to heal at its own pace. This approach is also a lot more comfortable, meaning you won’t have to take days or weeks out of your life to see results. While extreme cleansing may not be the safest way to become healthier, healthy, balanced cleanses can have a number of benefits. For example, going seven days without eating junk food may make it easier to eat less junk food in the months afterward. Additionally, eating a whole foods, plant-based diet for a week can energize your body to the point that you’ll want to continue making healthy choices. Nature Has Flavor: Cooking Your Way to a Healthier Life has 21 days of delicious plant-based recipes to set you on the path towards a lifetime of healthy cooking and living. 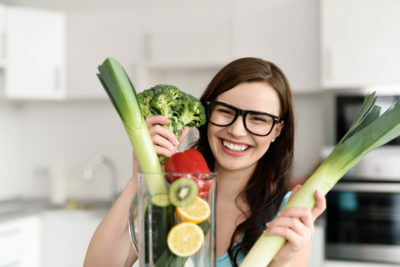 Once you know how to cook like a professional chef, you won’t have to choose between healthy food and tasty food — you’ll be getting the best of both worlds with every bite. At Nature Has Flavor, our goal is to set you up with the cooking skills needed to consistently eat healthy foods over the course of a long period of time. By doing so, you’ll avoid the discomfort and potential dangers of extreme cleansing, all while enjoying delicious meals using only plant-based ingredients.